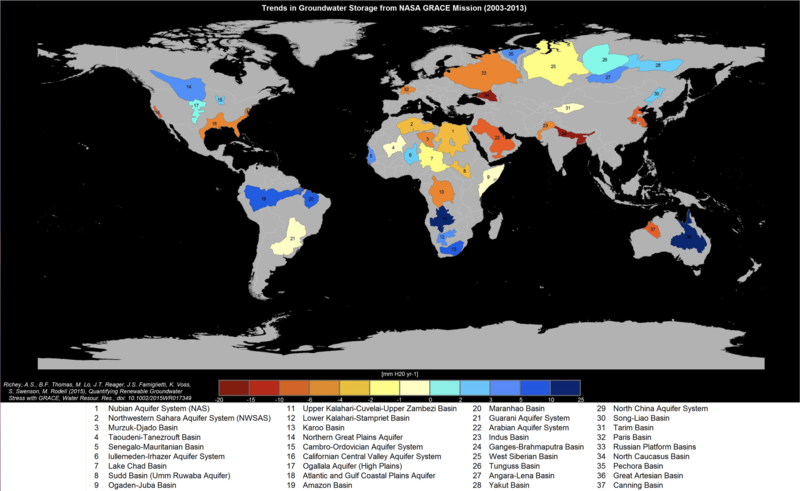 Groundwater storage trends for Earth’s 37 largest aquifers from UCI-led study using NASA GRACE data (2003 – 2013). Of these, 21 have exceeded sustainability tipping points and are being depleted, with 13 considered significantly distressed, threatening regional water security and resilience. A recent NASA study was performed to track global freshwater trends from 2002 to 2016 by collecting from the NASA Gravity Recovery and Climate Experiment. James Famiglietti, of the NASA Jet Propulsion Laboratory in California, explained, “What we are witnessing is major hydrologic change. We see for the first time a very distinctive pattern of the wetland areas of the world getting wetter, in the high latitudes and the tropics, and the dry areas in between getting drier. Within the dry areas, we see multiple hotspots resulting from groundwater depletion.” One of the areas that has been most affected is Antarctica, where 10% of its glaciers are in retreat. Both the climate crisis and human activity are the two main factors causing water scarcity today, calling upon greater action and better water management by humans before the issue gets worse.